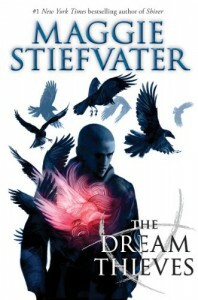 The Dream Thieves is the much awaited sequel to The Raven Boys, one of my favorite debut novels of 2012, as well as one of my all time favorite books. While The Dream Thieves did not reach the level of love I have for The Raven Boys, it was still a pretty darn good book. The Dream Thieves blew my mind so many times that I tried to stop being surprised and shocked every time but I failed. I know many readers doubt Stiefvater's story telling because of the overly romantic The Wolves of Mercy Falls trilogy, however The Raven Cycle series barely has romance and that allowed the author, and the readers, to really hone in on the amazingness of this plot. Unfortunately for me, The Dream Thieves focuses mostly on Ronan, one of Gansey's friends, if not the closest one. I personally had nothing against Ronan but through my one year wait all I could think about is that I'll finally get back into Gansey's head because of his fascinating way of thinking, as well as his budding... ok fine.. barely there, romance with Blue. After my initial disappointment, I can't lie, I was disappointed, I was quickly immersed in Ronan's story. Initially everything was confusing because I didn't remember everything from The Raven Boys but Ronan's story in itself is screwed up in the best way so I went along with it. In all honesty, the word beautiful disaster describes this whole series perfectly. Ronan had a fantastic inner voice; I did wonder, when I was reading The Raven Boys, about him and I'm glad that I did end up finding out so much about his history, secrets, and his "abilities", for lack of a better word. I still love the relationship between him and Gansey, as well as how tense it is with Adam. I just never understood how Gansey could be so forgiving of Adam (if you've read The Raven Boys, you'll understand what I mean), and was glad that not everything was swiped under the carpet, the way Gansey does it to try and keep the peace between them. To not get confused, this book isn't only told from Ronan's POV; It is the type of book with many alternative POVs. We see chapters dedicated to Gansey (yeay! ), Blue, some new characters we meet, as well as Adam. Blue and Gansey… I ship those two so unbelievably hard… I know most of you are wondering about this relationship and all I am saying is that it does progress.. but in the slowest possible way. I do enjoy a bit of romance in my non contemporary books, but not when it is the prevailing plot. I like that Stiefvater did a 180 degree flip with this series because you can definitely see the difference from The Wolves of Mercy Falls trilogy. All I can say is that the concept, the writing, and the progression of plot for The Dream Thieves was as brilliant as it was in The Raven Boys. Heck, I probably didn't understand everything that went on in The Dream Thieves but I loved every single minute of it. Readers who are looking for stories that keep you on the edge, as well as always feeling like you're two steps behind, i.e: never a dull moment, should definitely pick up this series and read both The Raven Boys and The Dream Thieves.